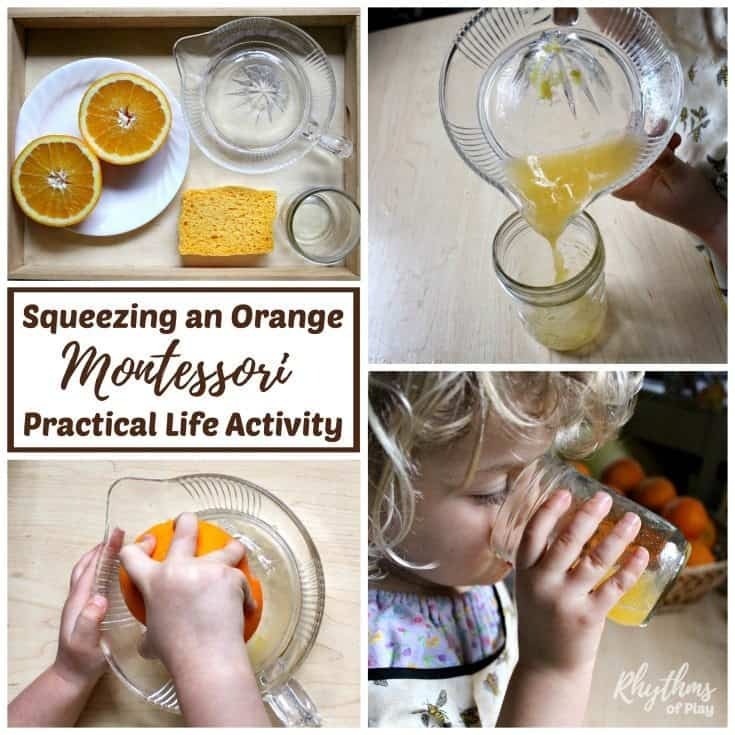 Squeezing an Orange Montessori practical life activity is a simple beginning food preparation activity that will help your child develop independence in the kitchen. 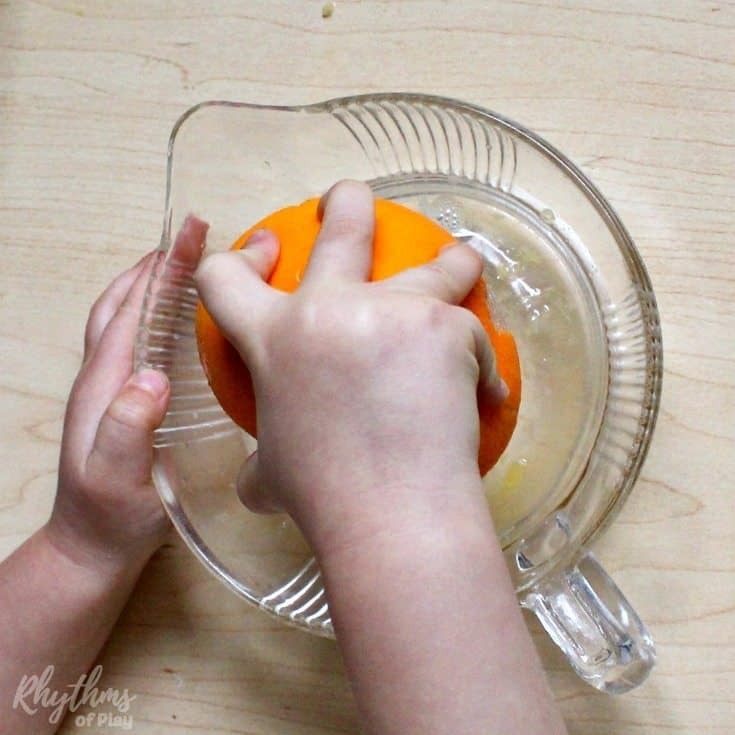 Squeezing an orange is also a great way to strengthen the hands and develop the fine motor muscles to prepare for writing. Another great way to prepare the hand for writing is learning to sew. Practical life learning activities like this make toddlers feel like they are making a contribution at home, give preschool aged kids a boost to their self-esteem, and help elementary aged kids gain confidence in the kitchen. Citrus juicer reamer with pour spout, citrus juicer with lid, or manual citrus juicer and juice pitcher. You will need to demonstrate how to do this activity the first time that you offer it. Complete the steps listed below in the exact way that you would like your child to complete the activity from start to finish. 2. Children aged 5 and up can be invited to cut the orange in half on a cutting board with adult supervision. 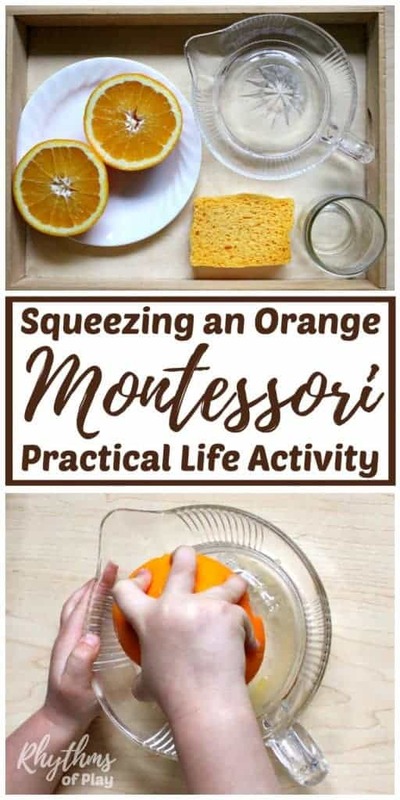 In this case, you can present the activity with an orange on top of the cutting board with a kids knife on the left of the orange. Place the citrus juicer on the right of the cutting board with a sponge and cup below it. 3. For children under 5 years old present the activity with a cut orange on a plate as shown in the photos above. They can then start the activity with squeezing an orange. 5. Pour juice into the cup after you are finished juicing each half of orange. (bottom right photo above) This gives children more opportunity to practice pouring. Another practical life activity that kids need to learn and master. Offering this flower arranging Montessori practical life activity and being in charge of watering a fairy garden are other great opportunities to practice pouring. 1. 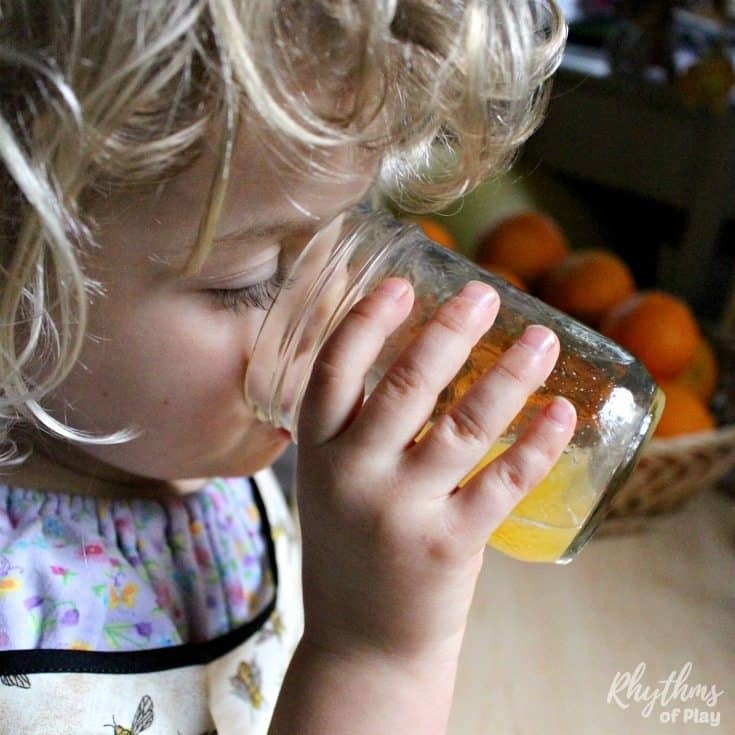 Remove the cup of orange juice from the table for the moment and have your child help you clean up. When finished teach them to put their apron or shirt away to signal that their work is complete. Completing the “work cycle” by doing practical life activities in the same order will help your child build healthy work habits. 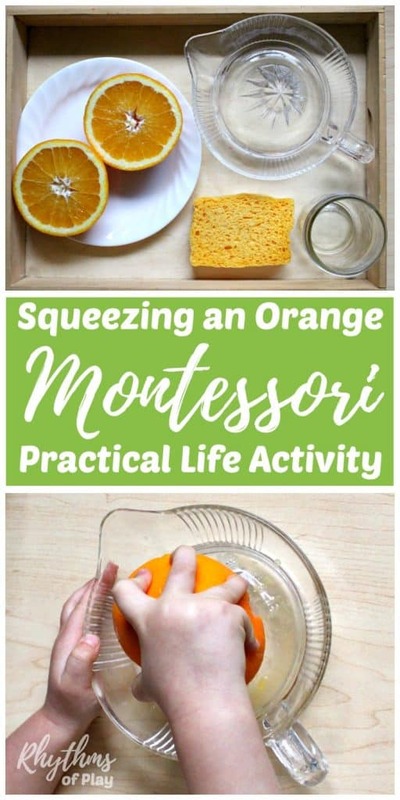 Squeezing an orange Montessori practical life activity is an easy first exercise in at home food preparation for kids. You may also like to try cutting a banana. 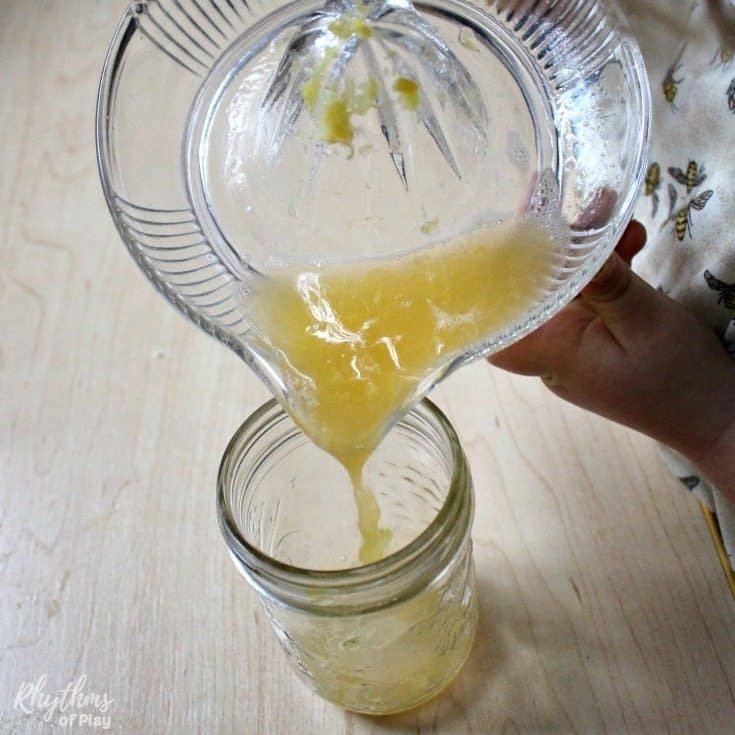 Another home life activity that will help your children develop independence in the kitchen. Practical life learning activities like squeezing an orange and cutting a banana help toddlers develop self-sufficiency in the kitchen, make preschoolers and kindergarteners feel like they are making a contribution at home, and help elementary aged kids build confidence and skills. To see a list of all of our most popular activities for kids click HERE! Learn more about rhythms of Play HERE. « Nature Craft Printables: Masks Tiaras Crowns and More!